The hardware section of Home Depot in Hoover, Alabama, might seem like an odd place for a rebel base. 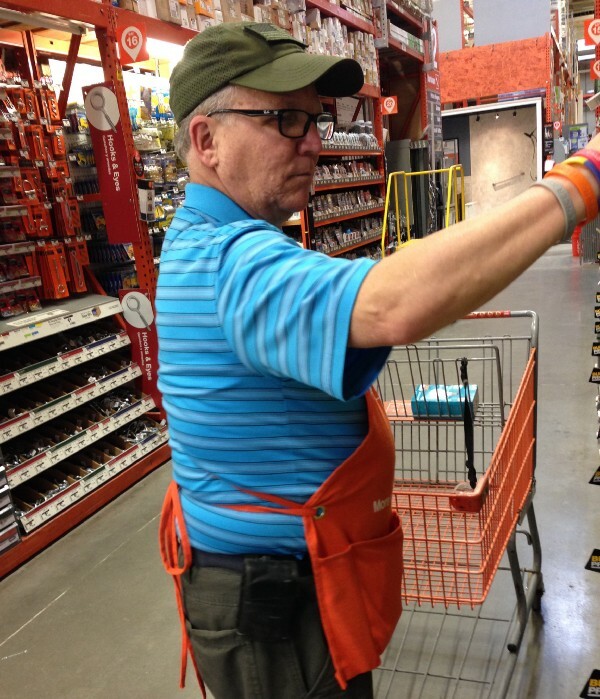 Here, jobs are what you’d expect: selling screws, teaching customers to use power tools. But that’s before Gustavo Diaz goes on break. With an old Blackberry, the 60-year-old is fact-checking communiqués from journalists in Venezuela, his home country, and publishing them to DolarToday, a guerrilla website he co-founded in 2011. It now boasts 2.7 million Twitter followers, and has withstood attacks by hackers and the Venezuelan government itself. You’d never know it, but this associate helping you choose a padlock has also been a Venezuelan army colonel; the head of security detail for a one-day president; the head of a car company; and a dissident whose voice has invited repeat attempts on his life. The son of a navy officer, Diaz moved around as a child, but he always called Caracas home. In 1979, after graduating from the military academy, he joined the army as an armor and cavalry officer, and quickly rose in the ranks, eventually becoming a senior lieutenant colonel of the third division, a rank just under general. “‘You serve your country, you respect the constitution, you respect the law,’” Diaz recalls his late father — a rear admiral who served under the democratic government restored by a 1958 coup unseating Marcos Pérez Jiménez — telling him upon his promotion. It wasn’t long before his loyalty would be tested. Hugo Chávez, a fellow officer, had become president, but by 2002, his approval rating had plummeted. He’d enraged the oil industry by replacing national oil workers with his own supporters and decimating foreign investment; on April 11, people took to the streets in protest. Nervous, Chávez bypassed the chain of command and ordered the subordinates of a general he distrusted — subordinates that included Diaz — to stop the protesters “by any means,” including killing them. Knowing the request was unconstitutional and violated international law, Diaz and his fellow officers chose to disobey. Eventually they talked the soldiers operating the tanks out of it as well by invoking the Nuremberg Trials. 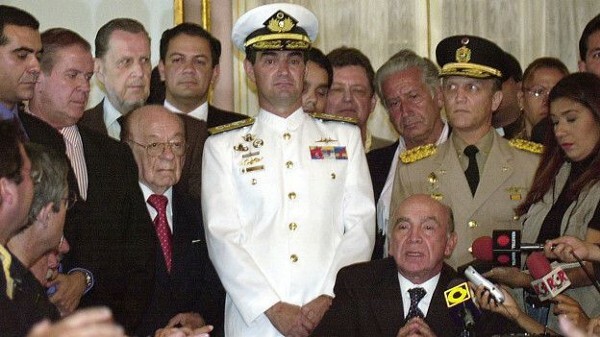 April 12, 2002, Pedro Carmona is installed as President of Venezuela. Diaz, in the beige military uniform, looks on. That day, Chávez was forcibly removed from office. Pedro Carmona, a centrist businessman, was chosen as interim president and appointed Diaz the head of his security detail. Forty-eight hours later, however, due to infighting among the new leaders and support for the deposed president from the Venezuelan poor, Chávez was reinstated. And Diaz was screwed. “I had to escape. I had to live in different houses … because the police was trying to find me everywhere,” he recalls. They almost caught him, too. Once, while being tailed, he stopped at a bakery and bought coffee for his pursuers. Eventually, though, he tired of hiding. So he resurfaced and got that car-company job through a friend. He continued participating in anti-Chávez protests — in uniform — though they had previously ended his first marriage (“I chose my country over my wife”) and led to his forcible (and, he claims, illegal, due to forged paperwork) retirement from the army. The last straw came one Friday when his car blew up. He wanted to keep fighting, but his colleagues, terrified his attackers would target him at work, begged him to take a vacation. A threatening phone call was answered by his nine-year-old son. Finally he acquiesced and took his family to visit his siblings in Tuscaloosa, Alabama. It was just in time, too — as soon as they arrived, he received a flood of messages from friends that he would be jailed the moment he returned to Venezuela. He quickly sought and was granted asylum (and later citizenship) in the U.S., where his family is safe. But the deal came at a cost: he can never go home. The bittersweetness didn’t end there. While relieved to be stateside, where “you can say whatever, freedom you never had in Venezuela,” Diaz was overqualified for every job he could get, first a factory gig at $10/hour, then as a technician with a pest-control company. The lack of “application of mind or knowledge,” he says, was frustrating. To make matters worse, he was overcome with guilt: while his friends and comrades were fighting Chávez in Caracas, he was enjoying the safety of life in America. But then he moved to Hoover, where he met Iván Lozada Sales and his cousin Altuve, two fellow exiled Venezuelans who shared his urge to continue fighting Chávez. The regime had outlawed American money, but it was still crucial for business and travel purposes, which meant underground exchanges; Altuve wanted to start a site that would use an algorithm to track the true black-market value of the U.S. dollar in Venezuela. Diaz wanted a platform to publish information leaked by muzzled and fearful Venezuelan sources. Thus DolarToday was born — coincidentally around the same time Chávez was secretly diagnosed with cancer. Rumors were flying everywhere, but DolarToday tracked down his doctors in the Cuban hospital where he was being treated to confirm. He knows what you’re thinking, by the way: why is a guy with a resume like this working at Home Depot as a sales associate? The answer is pretty simple: First, the site only makes enough money to pay for its maintenance, so he can’t quit his day job. Then, even if he could be promoted, it would mean having to prioritize his paid job over the site, and he refuses to do that. So he’s made peace with the balance. Devon Maloney is a pop culture writer who now knows more than she ever thought she would about 20th-century Venezuelan political history.